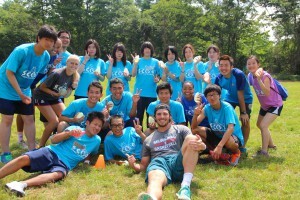 SCOA Summer Camp is a cultural exchange program aimed at providing children in Japan with opportunities to learn the joy of communicating in English and exposing them to foreign cultures at an early stage of their lives. SCOA (“Sports Camp of America”) is run by Keiko Best, who serves as Director, and J.R. Best, her husband. Keiko emphasizes the importance of exposure to foreign cultures at an early age. 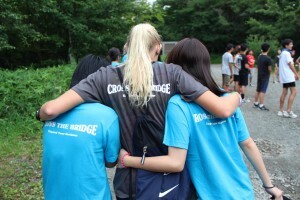 She is an active member of the English coaching team for Let’s Talk Foundation, and interacts directly with local children in Rikuzentakata. SCOA hosts 2 to 3-day camp programs with visiting instructors from the U.S. These camps provide children with valuable opportunities to spend a few days away from their parents, in an environment that allows communication only in English and body language. The campers will learn English in a fun and natural environment, as they try to communicate through physical and sport activities. These activities tend to motivate children to learn, providing an excellent environment to touch other cultures and gain English-speaking ability. Please watch the introductory video that shows the atmosphere of a SCOA camp where children are speaking English naturally. Every year since 2013, we took in applicants from amongst the participants of Komo’s English Class for sponsorship in SCOA camps. We accept all who wish to participate, in principle. We ask the children who participate in the camp to write up a feedback report, to ensure the merit of our sponsorship. Currently we do not publish their feedback reports in protection of the privacy of minors. In 2015, SCOA designed special session for high school students which emphasizes leadership. With Toryo high school in , high school students joined this special SCOA. Let’s Talk Foundation provided financial support. Here is some of the reports by the high school students who joined SCOA in 2015. Children return from the camp with visible growth, after using English in real-life situations and interacting with people from other regions and with different cultures. We appreciate your support for continuing and expanding our SCOA sponsorship. You could assist in a form of financial support for camp fees and transportation costs (as financial contributor), or logistical support (as active contributor), such as chaperoning. Please contact us for more information on how you could assist.